Housing values are forecast to fall 11.4 per cent in Melbourne and 9.3 per cent in Sydney this year before “a slow recovery” in 2020, Moody’s Analytics says. The March index, released by Corelogic and Moody’s Analytics, show declines across capital cities led by largest property markets Melbourne and Sydney. National housing values have recorded sharper declines than apartment values, with housing recording a 9 per cent drop from its 2017 peak, compared to a 6 per cent drop for apartments, reveals the latest Australian Home Value Index. While the Australian economy has enjoyed a solid run with 2018 marking the 27th year of recession-free growth, Moody’s Analytics economist Katrina Ell says the national index for home values has now recorded declines for a year and a half, falling for the 17th consecutive month. 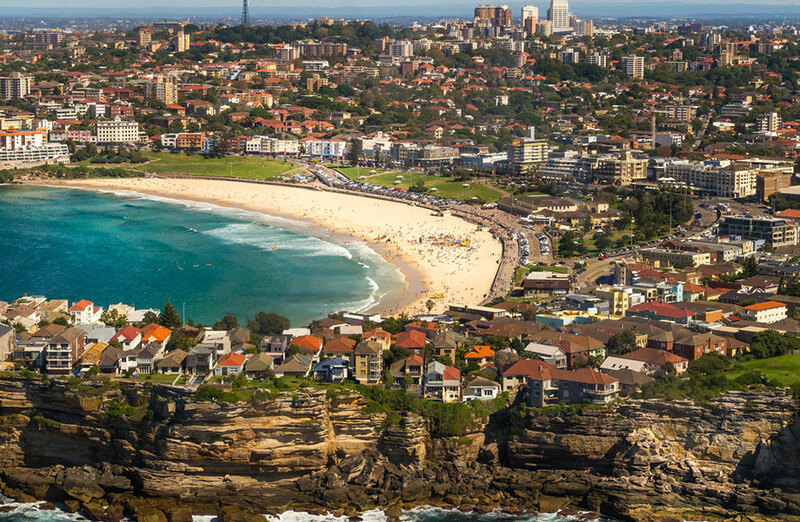 Sydney house values are forecast to fall a further 9.3 per cent in 2019 before a slow recovery in 2020, the report shows. House values across Sydney declined by 5.5 per cent last year, the falls follow the 12.8 per cent rise in 2017. Sydney apartment values are expected to decline at a slower pace, down 5.9 per cent this year. Moody’s forecasts an improvement of 4.2 per cent in the apartment market in 2020, followed by an improvement of 4.7 per cent by 2021. “Sydney has been a key driver of the slowdown given the stellar run-up in values in the past five years,” Ell said. House values have fallen by almost 20 per cent since the most recent peak in July 2017. “It’s important to keep the correction in context. House values in Sydney remain around 60 per cent higher than they were in 2012,” the report noted. The correction in Sydney is forecast to have largely passed by 2020, but home value growth will be “far from the lofty gains” of recent years, Moodys Analytics says. Moody’s expects house values in Melbourne to decline sharply in 2019, following a “modest correction” last year. House values in Greater Melbourne are down 12 per cent from their peak. But the downturn has been most pronounced in Melbourne’s inner suburbs. 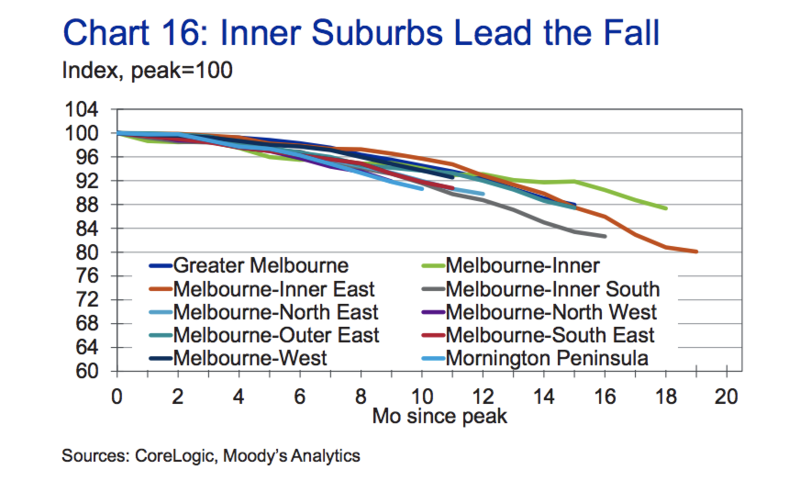 “The majority of the decline and slowdown will be concentrated in the Inner Melbourne regions,” Ell said. House values in Melbourne-Inner East have fallen 20 per cent from their peak, while house values in Melbourne-Inner South have decreased 17.4 per cent from peak. Ell says Melbourne’s apartment market is also expected to correct in 2019 and 2020, following a sharp slowdown last year. Queensland’s housing market is “expected to remain diverse”. House values across Brisbane are forecast to see a correction in 2019, with strength in East Brisbane offset by declines elsewhere. “The worst is likely over for Brisbane’s apartment market,” Ell said. “The addition to the stock of apartments has been lower. Therefore, a reduced apartment glut will likely result in a broad-based recovery in apartment values from 2019 onwards,” the report notes. Apartment values are tipped to recover by 0.9 per cent in 2019, followed by stronger growth of 5.8 per cent in 2020. The report forecasts Perth house values as likely to decline 7.6 per cent this year, followed by a small recovery in 2020. “A slow housing recovery in 2020 is likely as the local economy improves thanks to population growth,” Ell said. 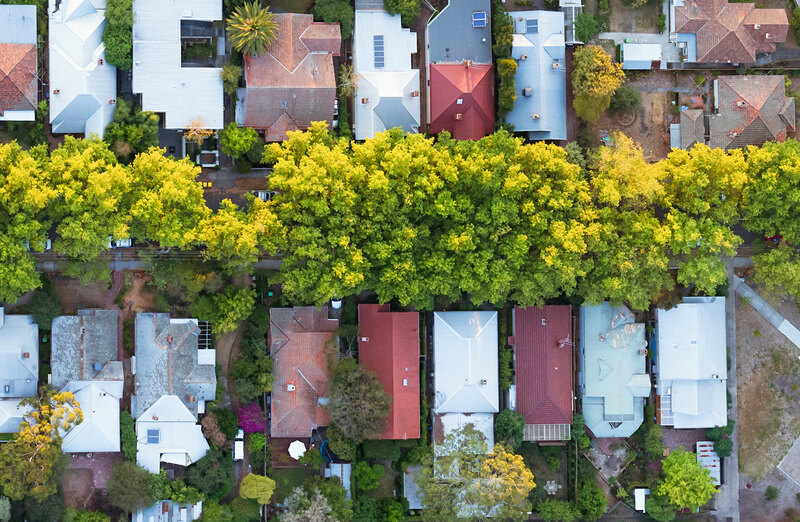 While Adelaide’s stable housing market is likely to continue, Ell says house values are forecast to rise 1 per cent in 2019 following a 1.9 per cent increase last year.